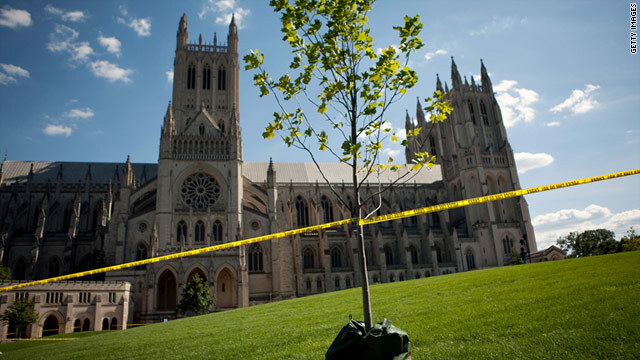 The National Cathedral is taped off after suffering damage Tuesday. -- The U.S. Capitol was cleared for employees to come back to get their belongings, but inspectors asked people to limit their time inside the building while engineers continue to work around the complex. -- A secondary inspection of the Washington Monument revealed some cracking in the stones at the top of the monument, the National Park Service said. Structural engineers will evaluate the cracks on Wednesday to determine the best way to repair the 126-year-old obelisk before it is reopened. The monument grounds have been reopened except for an area about 100 feet outside of the plaza. -- The National Park Service said it reopened the Lincoln Memorial and Jefferson Memorial at 7:20 p.m. The Old Post Office Tower will reopen at 9 a.m. Wednesday. East Coast ready for major earthquake? -- The National Cathedral will be closed to the public Wednesday after three of the four corner spires on its central tower cracked and fell onto the roof. "Engineers report that the building itself did not incur any damage to its structural integrity," the church said in a news release Tuesday. -- The Smithsonian Institution Building in Washington has cracks in the interior walls because of the earthquake, but there's no indication of structural damage at this point, Smithsonian Secretary Wayne Clough said. The building will still need to be evaluated, he said. -- All Smithsonian museums shut down for the day, the institution said. -- The White House and adjacent buildings evacuated as a precaution following the earthquake were given the all-clear, the U.S. Secret Service said. The FBI and Justice Department have also reopened evacuated buildings. -- Some personnel were evacuated from the Department of Homeland Security facility in northwest Washington, but the national operations center remained functional, a homeland security official said. -- Terminal A at Washington Reagan National Airport was evacuated because of an odor of gas, airport spokeswoman Courtney Mickalonis said. Initial sweeps of the building showed no major damage from the earthquake. -- At the new Martin Luther King Jr. National Memorial, which has a dedication scheduled for Sunday, "all is good," an organizer said. "We're performing the required safety checks and procedures, and Park Service has been on site with us monitoring (the) situation." Along with the King Memorial, the Franklin Delano Roosevelt, World War II, Vietnam Veterans and Korean War memorials all remain open. -- In New York City, there were "no reports of significant damage," said Mayor Michael Bloomberg. "Shortly before 2 p.m., we evacuated City Hall briefly, but quickly returned to work," he said in a statement.